Meet Nexgard - a flea and tick preventative from the makers of Frontline Plus, the #1 choice of veterinarians, and the FIRST flea and tick killer in a beef-flavored chew. 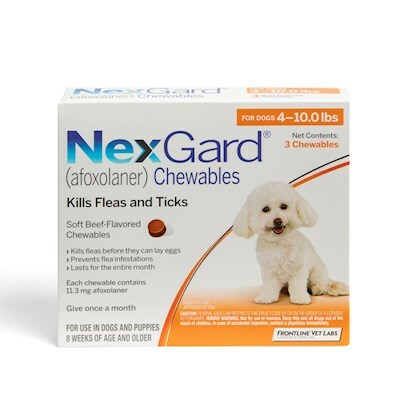 NexGard for dogs kills adult fleas before they lay eggs, and kills ticks, too. All in a delicious, soft chew that dogs love. NexGard soft chew is FDA-approved and proven safe for use in dogs. It contains an ingredient, afoxolaner, that helps treat and control fleas and ticks and keeps killing for a full 30 days.5 So it helps provide protection you can feel good about. Administer 1 Nexgard chew per month, per body weight. For best results, ensure dog consumes entire chew.